The New Zealand Aid Programme has recently signed a 3 year partnership with Oceania Football Confederation for Just Play. The quality of the Oceania Football Confederations award winning Just Play Programme has helped it edge out numerous development projects to secure a three year partnership with the New Zealand Aid Programme. The New Zealand Aid Programme is the New Government’s aid and development programme managed by development specialists in the Ministry of Foreign Affairs and Trade. It is charged with supporting sustainable development in developing countries in order to reduce poverty and contribute to a more secure, equitable and prosperous world – a mandate that links closely with that of successful sport for development programme Just Play. Ofc President David Chung says this partnership is the fruit of groundwork which has been laid by the OFC Social Responsibility department since Just Play’s inception in 2009. “Just Play has been addressing the growing obesity epidemic by engaging children around the Pacific region in physical activity, while also addressing several other social issues including social inclusion and gender equality,” Chung says. Phase 1 was the establishment and implementation of the Just Play Programme in Tonga in 2009 with the support of the Australian Government, through the Australian Sports Commission, UEFA and Football Federation of Australia. Just Play was extended to nine further Pacific Island countries between 2009 and 2013. The New Zealand Aid Programme’s alignment with Just Play coincides with the launch of Phase 2 and OFC Head of Social Responsibility and International Relations Franck Castillo says it’s an important partnership for Just Play going forward. “That Just Play was one of the projects chosen from this group is testament to the quality of the programme. Phase 2 of the Just Play Programme has seen the new curriculum developed and launched with the expertise of another programme partner, UNICEF, with an integrated focus on social development and a target shift to reach children aged 5-13 years old in both communities and schools. The partnership with UNICEF has seen the development of a complementary monitoring and evaluation system whereby teachers and volunteers are equipped with the tools and skills to help monitor results. The New Zealand Aid Programme will support Just Play for three years from 2015-2018 focusing on Cook Islands, Fiji, Samoa, Solomon Islands and Tonga. 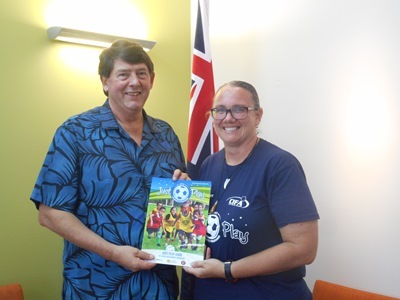 The Cook Islands Football Association is delighted with the partnership and support of the New Zealand Aid Programme and looks forward to working closely with the New High Com here in the Cook Islands.